Current police beat boundaries in Chicago. The data can be viewed on the Chicago Data Portal with a web browser. However, to view or use the files outside of a web browser, you will need to use compression software and special GIS software, such as ESRI ArcGIS (shapefile) or Google Earth (KML or KMZ), is required. Police beats in Chicago that were effective through December 18, 2012. The current police beats boundaries are always available at https://data.cityofchicago.org/d/aerh-rz74. The data can be viewed on the Chicago Data Portal with a web browser. However, to view or use the files outside of a web browser, you will need to use compression software and special GIS software, such as ESRI ArcGIS (shapefile) or Google Earth (KML or KMZ), is required. Police beat boundaries in Chicago which are effective as of December 19, 2012. The data can be viewed on the Chicago Data Portal with a web browser. However, to view or use the files outside of a web browser, you will need to use compression software and special GIS software, such as ESRI ArcGIS (shapefile) or Google Earth (KML or KMZ), is required. Police beats in Chicago. To view or use this KMZ file, compression software, such as 7-Zip, and special GIS software, such as Google Earth, are required. To download this file, right-click the "Download" link above and choose "Save link as." Police district boundaries in Chicago. To view or use these files, compression software and special GIS software, such as ESRI ArcGIS, is required. Current police district boundaries in Chicago. The data can be viewed on the Chicago Data Portal with a web browser. However, to view or use the files outside of a web browser, you will need to use compression software and special GIS software, such as ESRI ArcGIS (shapefile) or Google Earth (KML or KMZ), is required. Police district boundaries in Chicago that were in effect through December 18, 2012. The current police district boundaries can always be found at https://data.cityofchicago.org/d/fthy-xz3r. To view or use these files outside of a web browser, compression software and special GIS software, such as ESRI ArcGIS, is required. Police district boundaries in Chicago that are effective as of December 19, 2012. The data can be viewed on the Chicago Data Portal with a web browser. However, to view or use the files outside of a web browser, you will need to use compression software and special GIS software, such as ESRI ArcGIS (shapefile) or Google Earth (KML or KMZ), is required. KML files of police districts in Chicago. To view or use these files, special GIS software such as Google Earth is required. Illinois Uniform Crime Reporting (IUCR) codes are four digit codes that law enforcement agencies use to classify criminal incidents when taking individual reports. These codes are also used to aggregate types of cases for statistical purposes. In Illinois, the Illinois State Police establish IUCR codes, but the agencies can add codes to suit their individual needs. The Chicago Police Department currently uses more than 350 IUCR codes to classify criminal offenses, divided into “Index” and “Non-Index” offenses. Index offenses are the offenses that are collected nation-wide by the Federal Bureaus of Investigation’s Uniform Crime Reports program to document crime trends over time (data released semi-annually), and include murder, criminal sexual assault, robbery, aggravated assault & battery, burglary, theft, motor vehicle theft, and arson. Non-index offenses are all other types of criminal incidents, including vandalism, weapons violations, public peace violations, etc. Complaints received by the Civilian Office of Police Accountability and its predecessor agency. A case will generate multiple rows, sharing the same LOG_NO if there are multiple complainants or subjects. Each row in this dataset is a complainant or subject in a specific case. Other than identifying the Log Number associated with an investigation being conducted by the Bureau of Internal Affairs section of the Chicago Police Department, information regarding such investigations is not included in this data set. Cases received by the Civilian Office of Police Accountability and its predecessor agencies. A case will generate multiple rows, sharing the same LOG_NO if there are multiple reported victims. Each row in this dataset is a reported victim in a specific case. The (No value) bars below come from Bureau of Internal Affairs records. Other than identifying the Log Number associated with an investigation being conducted by the BIA section of the Chicago Police Department, information regarding such investigations is not included in this data set. A case will generate multiple rows, sharing the same LOG_NO if there are multiple officers. Each row in this dataset is an officer in a specific case. Each complaint is represented by a single line. When multiple people are involved, values for each of them are separated by the | character. In all such columns, the people are presented in the same order. For example, the first value in one column corresponds to the same person as the first value in another column. This dataset reflects reported incidents of crime (with the exception of murders where data exists for each victim) that occurred in the City of Chicago from 2001 to present, minus the most recent seven days. Data is extracted from the Chicago Police Department's CLEAR (Citizen Law Enforcement Analysis and Reporting) system. In order to protect the privacy of crime victims, addresses are shown at the block level only and specific locations are not identified. Should you have questions about this dataset, you may contact the Research & Development Division of the Chicago Police Department at 312.745.6071 or RandD@chicagopolice.org. Disclaimer: These crimes may be based upon preliminary information supplied to the Police Department by the reporting parties that have not been verified. The preliminary crime classifications may be changed at a later date based upon additional investigation and there is always the possibility of mechanical or human error. Therefore, the Chicago Police Department does not guarantee (either expressed or implied) the accuracy, completeness, timeliness, or correct sequencing of the information and the information should not be used for comparison purposes over time. The Chicago Police Department will not be responsible for any error or omission, or for the use of, or the results obtained from the use of this information. All data visualizations on maps should be considered approximate and attempts to derive specific addresses are strictly prohibited. The Chicago Police Department is not responsible for the content of any off-site pages that are referenced by or that reference this web page other than an official City of Chicago or Chicago Police Department web page. The user specifically acknowledges that the Chicago Police Department is not responsible for any defamatory, offensive, misleading, or illegal conduct of other users, links, or third parties and that the risk of injury from the foregoing rests entirely with the user. 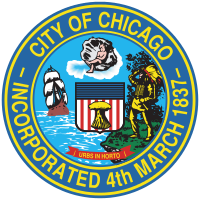 The unauthorized use of the words "Chicago Police Department," "Chicago Police," or any colorable imitation of these words or the unauthorized use of the Chicago Police Department logo is unlawful. This web page does not, in any way, authorize such use. Data is updated daily Tuesday through Sunday. The dataset contains more than 65,000 records/rows of data and cannot be viewed in full in Microsoft Excel. Therefore, when downloading the file, select CSV from the Export menu. Open the file in an ASCII text editor, such as Wordpad, to view and search. To access a list of Chicago Police Department - Illinois Uniform Crime Reporting (IUCR) codes, go to http://bit.ly/rk5Tpc.